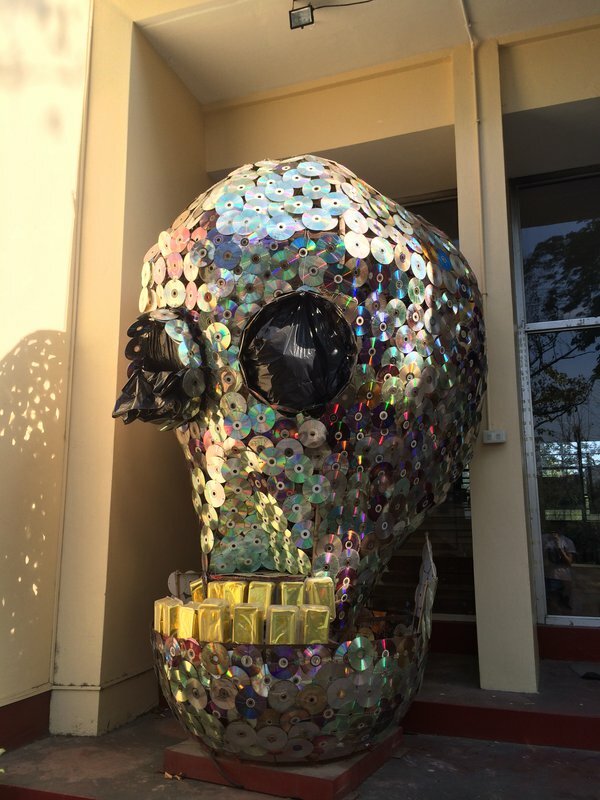 A skull of CDs in front of the Archaeological Studies Program building (Albert Hall) in UP Diliman. Probably created for the 2014 UP Lantern Parade. Some time ago, Sandwich shared an article entitled “When CDs Were Precious Objects” on their Facebook page with the caption “A younger generation’s Betamax.” It made me wax nostalgic about my own relationship with these shiny, delicate discs. About a decade ago when I was a high school freshman, a band called Hale was terribly popular and one of my classmates received a copy of their debut album as a birthday gift. I liked “The Day You Said Goodnight” so I was curious about the entire album—and when I learned that my classmate already had a copy of the CD, I bugged him all day to donate the extra one to me, which he did. Why didn’t you just download the music, kids these days might ask. Because 56-kbps dial-up was all I had then for an Internet connection, and downloading an entire album’s worth of high-quality audio was an all-week, all-night affair. (And it cost 100 pesos per 20 hours.) Besides, Hale’s album is a beautiful artifact. Its album sleeve is a work of art—full of sepia photography alternating with lyrics written in fine calligraphy on translucent paper. A few months later at a gig in Siena College, I was able to get that album signed by Hale themselves, and they wrote the email address for their Yahoo! Groups site on the cover. That, and that albums often contain fantastic artwork. They open secret, private spaces for the listener, and I feel that I can appreciate the music all the more with something visual to hold on to. Aside from photography and illustrations, there are occassional gimmicks—two of Sandwich’s albums are full of colorful stickers, for example. The first disc I bought, after getting Hale’s debut album, was 6 Cycle Mind’s Panorama. I followed up with Sandwich’s Five on the Floor, then slowly, my collection grew. It was the mid-2000s, after all, a time that would be remembered in Philippine music history as a short-lived renaissance period in the local band scene, a time when the homegrown dominated the mainstream airwaves. My favorite store was Tower Records, and I always looked forward to browsing row after row of the smooth, plastic-cased discs. It was imperative for me to flip through the stacks and see all the albums for sale; I couldn’t just go to the store and be content with scanning the cover artworks displayed up front. There’s always the gem of a record hiding among the piles, like a Thanks to the Moon’s Gravitational Pull special edition (comes with a VCD of music videos! ), or a Take 2 by Imago (with the Sennheiser headphone ear cup as the design for the CD print). Sometimes I bought CDs because I’ve already heard one or two songs off them on LS FM 97.1 and I liked it; sometimes I bought CDs just because of the inviting artwork, or because the song titles sounded curious. But then the stores started folding up. The huge ones are now hard to come by. I’m not aware of any existent Tower Records branch; I just assume that the company has shut down. Odyssey and Astrovision/Astroplus are still around but branches with a wide CDs section are now far and few in between. I’ve noticed that some of their stores are dedicating more and more floor space to selling audio equipment—Bluetooth speakers, fashionable headphones—instead of CDs and other physical multimedia content. The CD industry is at a decline, there’s no doubt about that. The real question is how long before it actually says goodbye. Some prominent music labels have already closed shop, such as Sony Music Philippines. The latest computers are shipping without CD drives, and it probably won’t be long before they disappear altogether like floppy disk drives. Digital is the future, they say. Aside from piracy, there are both legal online stores (iTunes) and the newfangled streaming services (Spotify), enabled by the continued spread of Internet access and the obsession of the public with smartphones and tablets. I’ve bought and downloaded some records from Bandcamp myself; it’s at least nice to know that the new technologies allow emerging artists to connect to an audience they couldn’t otherwise reach without a record label to produce CDs for them. What will happen to CDs? Part of me likes to think that they will hang around for the loyalists like myself, those who want something physical to go along with their music. Like vinyl, and all the hipsters and analog junkies still collecting them. What will happen to my own collection? I’m looking forward to the day when I will put them up on a permanent exhibit wall in my own home, maybe complete with gallery lighting and protective glass casing. And then the kids of the next generation will be able to marvel at the low-tech relics of a bygone era.